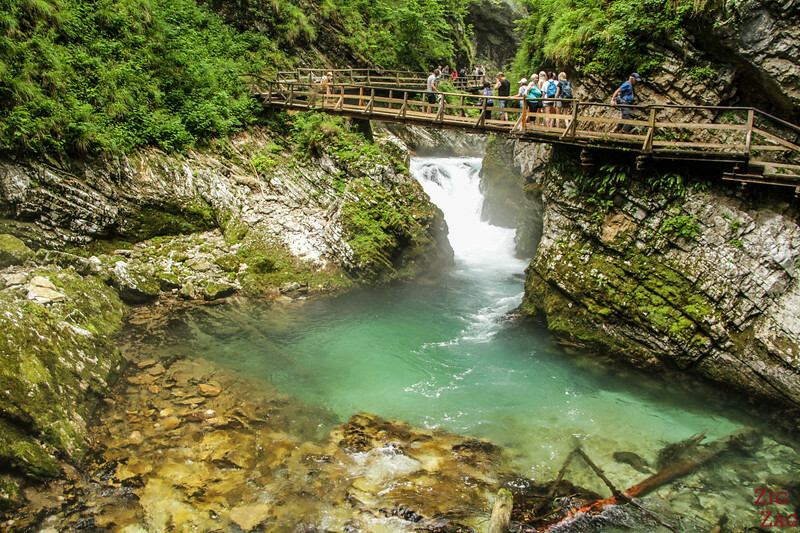 MAGICAL... the Vintgar Gorge Walk is simply magical! 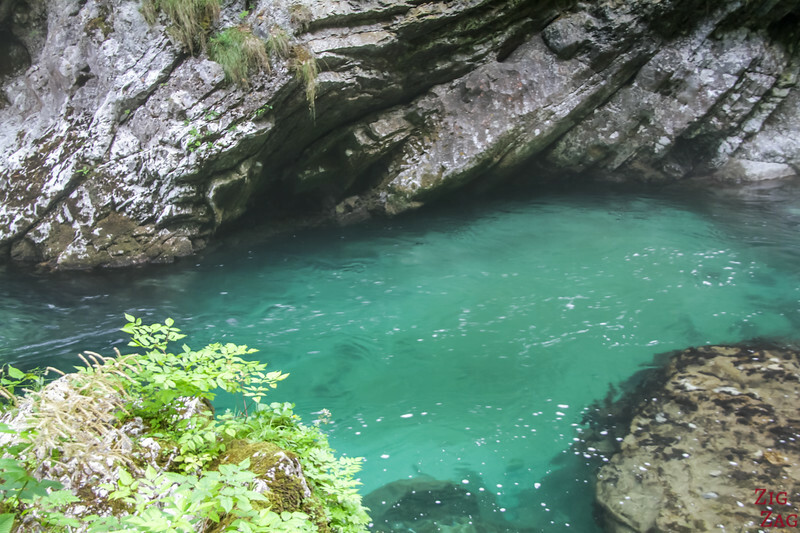 The Lake Bled Gorge is one of the most visited places in Slovenia for good reasons. Discover it in video and photos and learn some tips to plan your walk and make the most of your visit! 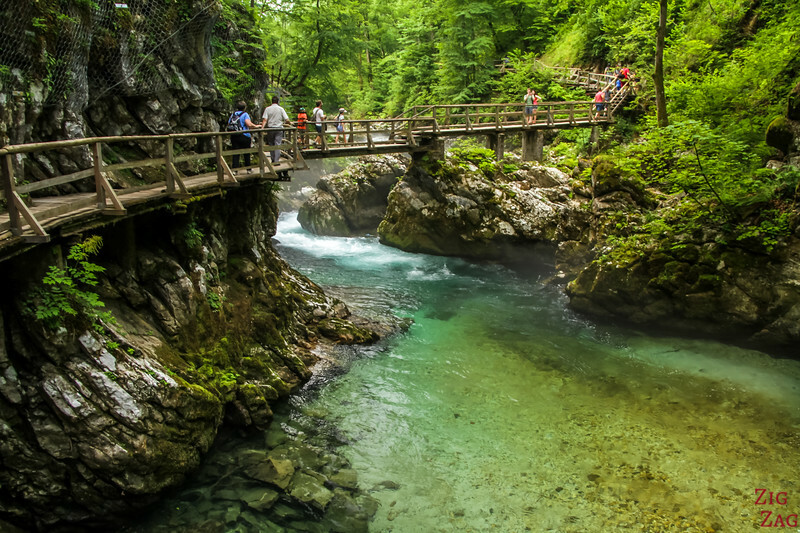 Let's start with a short video that will transport you there and and take you on the walk along the Lake Bled Gorge. This should give you a good idea of what you can expect. 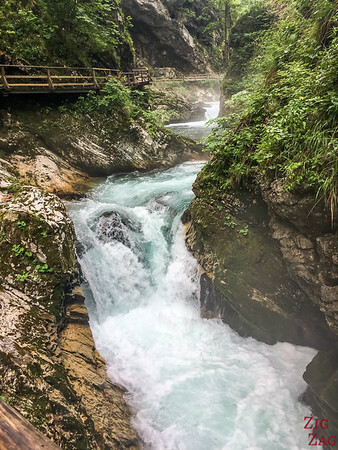 And before I let you know more about the gorge and the walk, here is one of my favorite photos that summarizes what is amazing about the Vintgar Gorge - the rocks, the path and bridges and the color of the water! 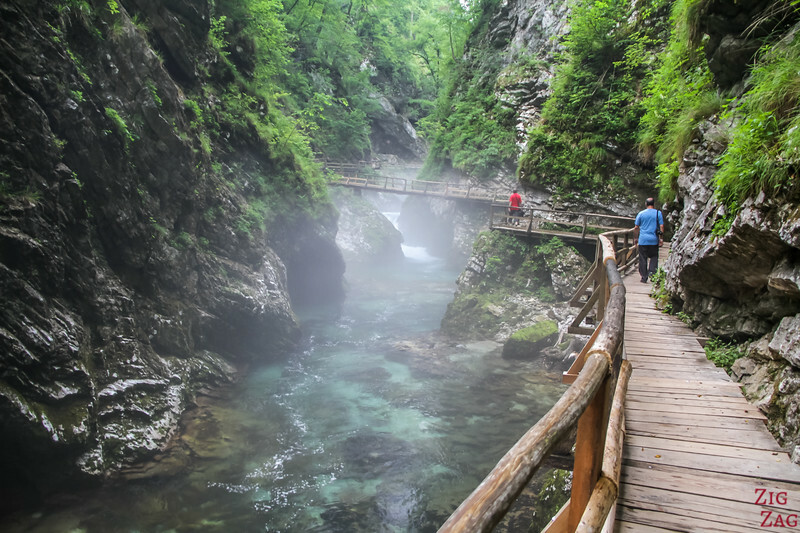 I think this is one of the best things to do near Lake Bled Slovenia. 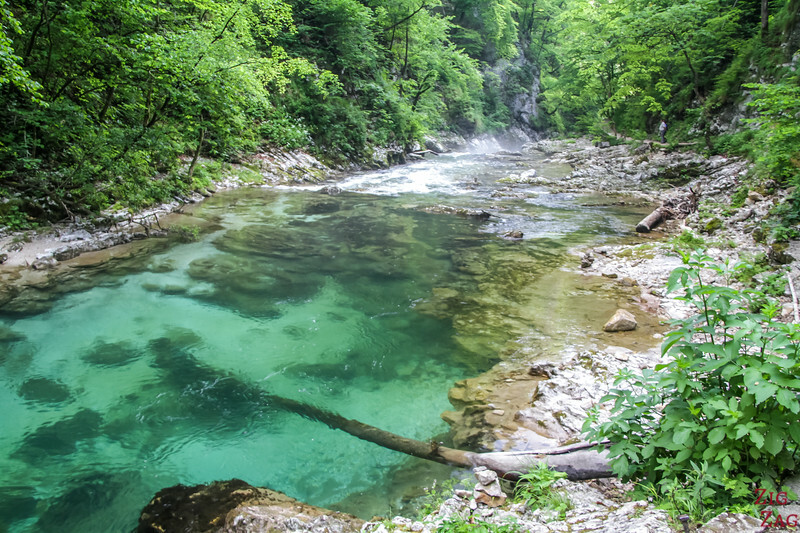 The Vintgar Gorge Parking is a 4km drive north-west of Bled. This is a small road but not very difficult. The parking is quite large but it fills up very quickly! 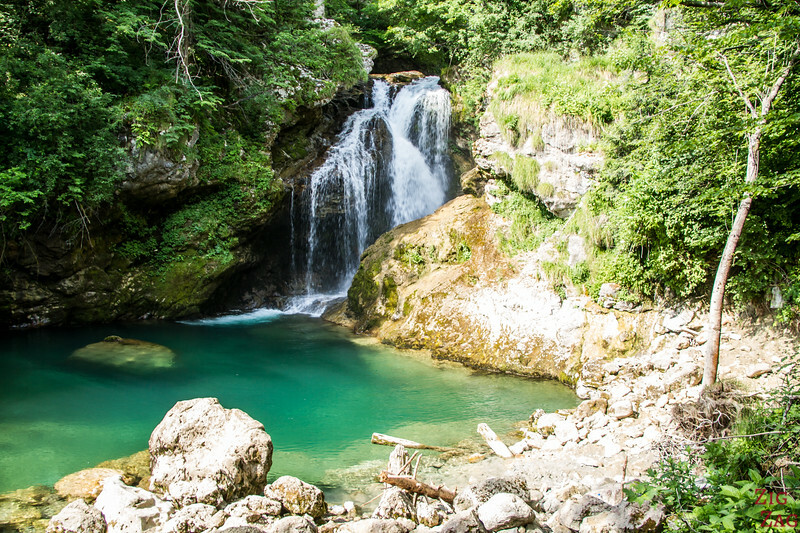 - At the end of the article, I give your some options to get there from lake Bled or Ljubljana. 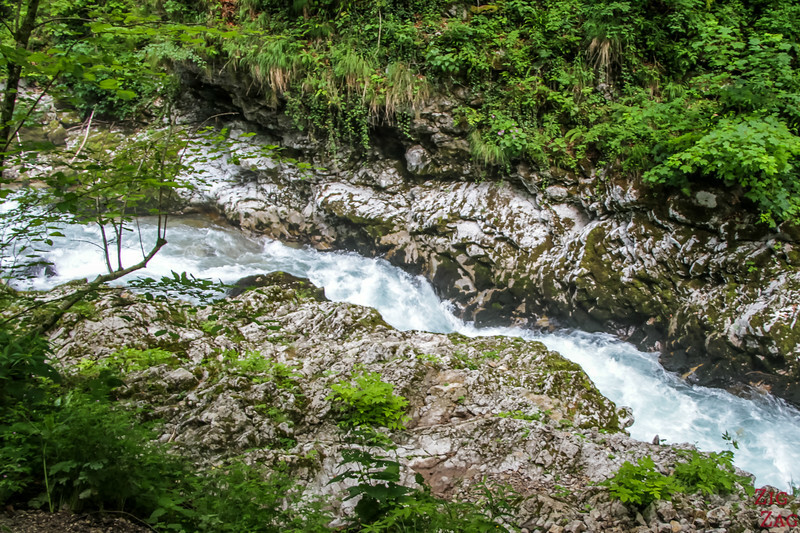 The Vintgar gorge is where the Radovna River cuts into the hills of Hom and Bordt. 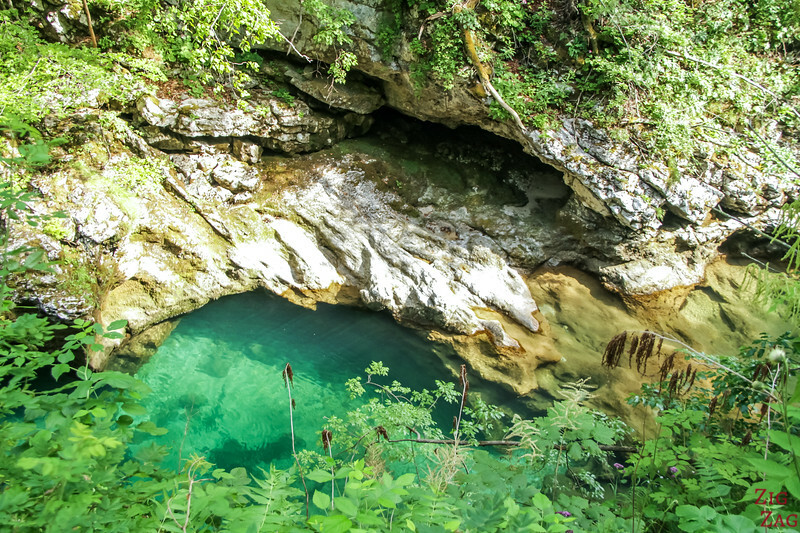 Discovered in 1891, it was soon arranged with board walks to open it to the public. The river is rushing and roaring and the gorge is sometimes narrow, so the construction to secure the trail was not easy but they sure did a wonderful job. 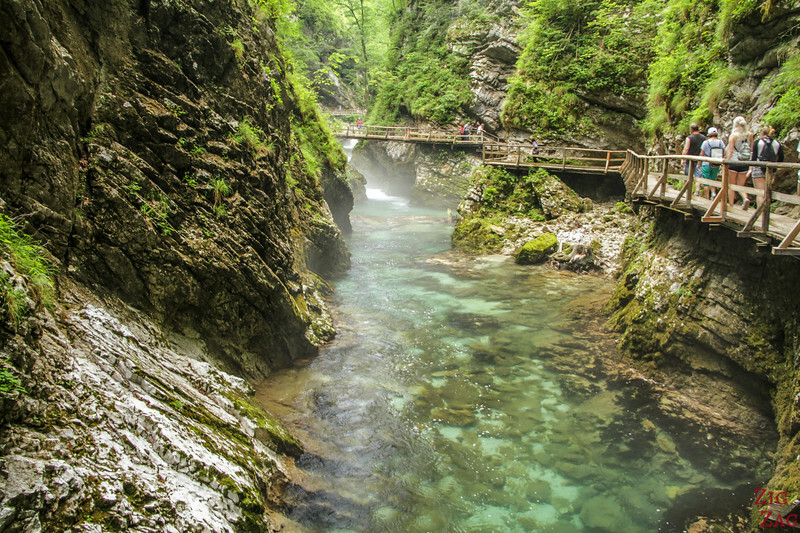 The Gorge is 1.6km long and fascinating all the time. NO boring moment. 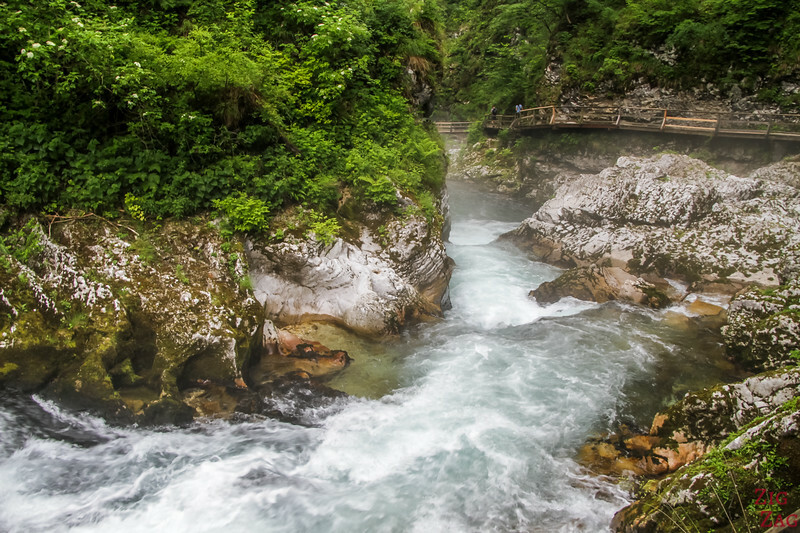 Many times the path continues on the other side and you get to walk above the rushing water. This is absolutely phenomenal. I felt secure the whole way. The Bridges are not moving. And even my mum who suffers from vertigo did not have difficulty walking through the gorge. 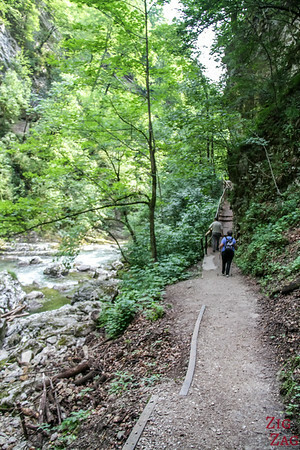 As you can see below, along the gorge itself it sometimes goes up and down with some steps (roughly 60 of them). And if you decide at the end to go down to see the Sum waterfall (see pictures later) you will have to go down 60 more steps (and back up to go back). 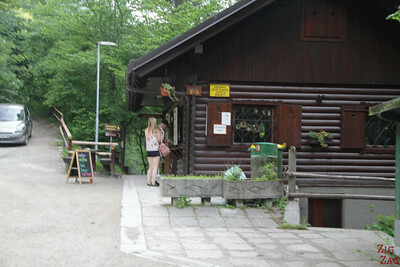 We saw the entrance hut at one end. 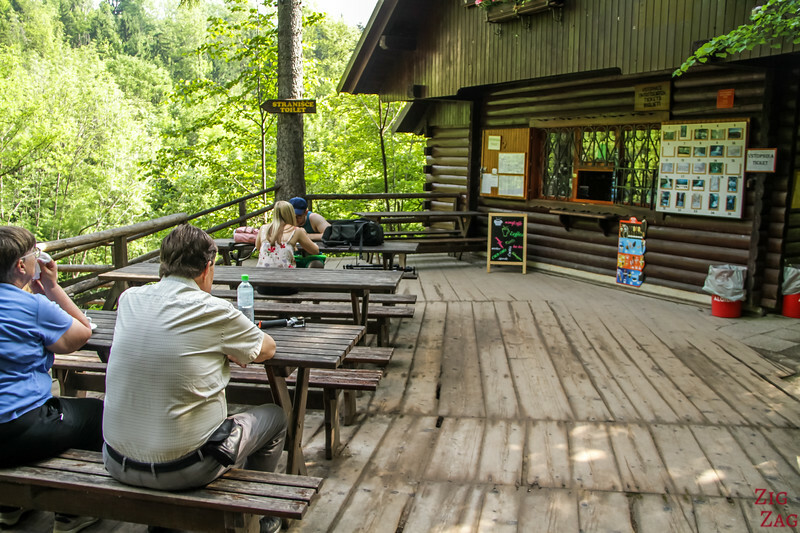 At the other end, you also have an entrance hut that is also a cafe. Nice to take a break before walking back. 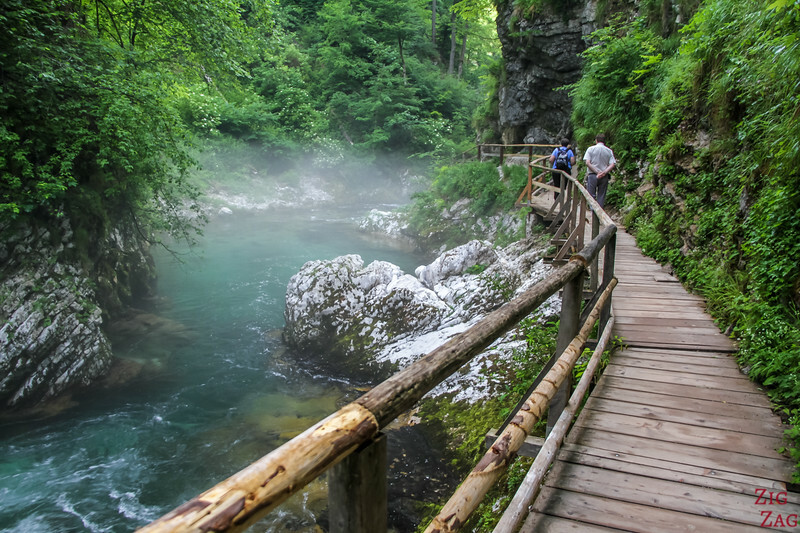 The Vintgar Gorge, along with many other beautiful places, is included in my eBook: The Road Trip Guide-Slovenia. My preference goes to the first half of the gorge. So if you are limited in time you can just do that and walk back. It is so difficult to choose pictures. The whole place is magical. Pack a large memory card for your camera! 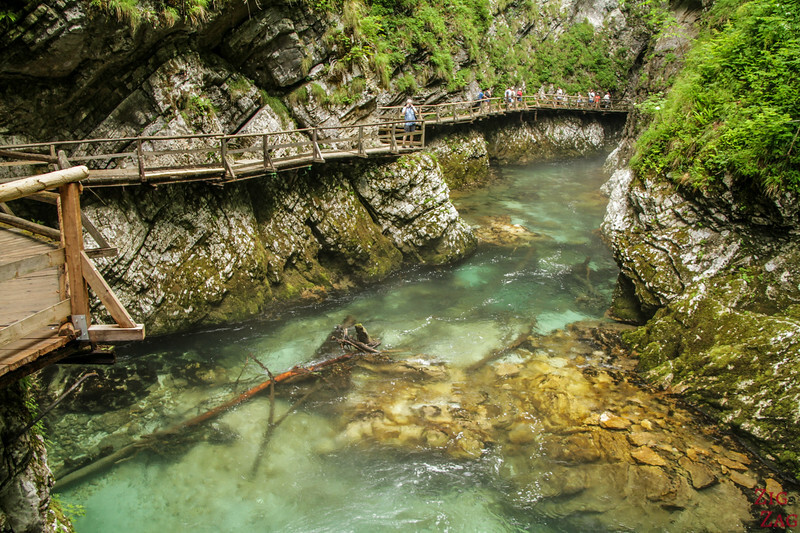 The observation bridges are really great. 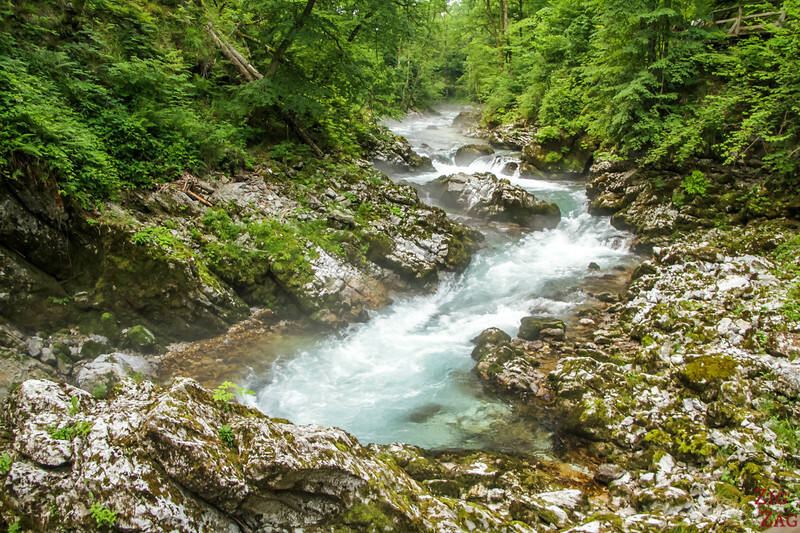 And sometimes the water is white and rushing on one side but calm and emerald on the other - you might have noticed some sequences of the video. 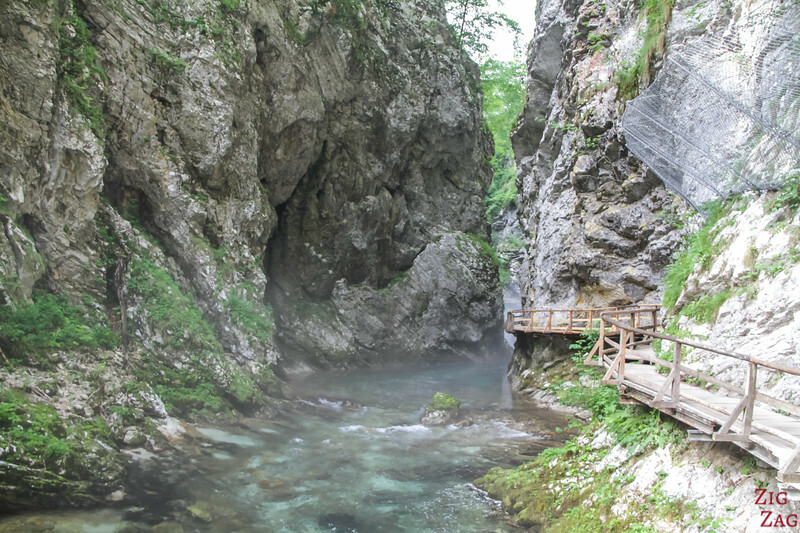 The Gorge walls are 50 to 100meters in height. The wind did not create that canyon. 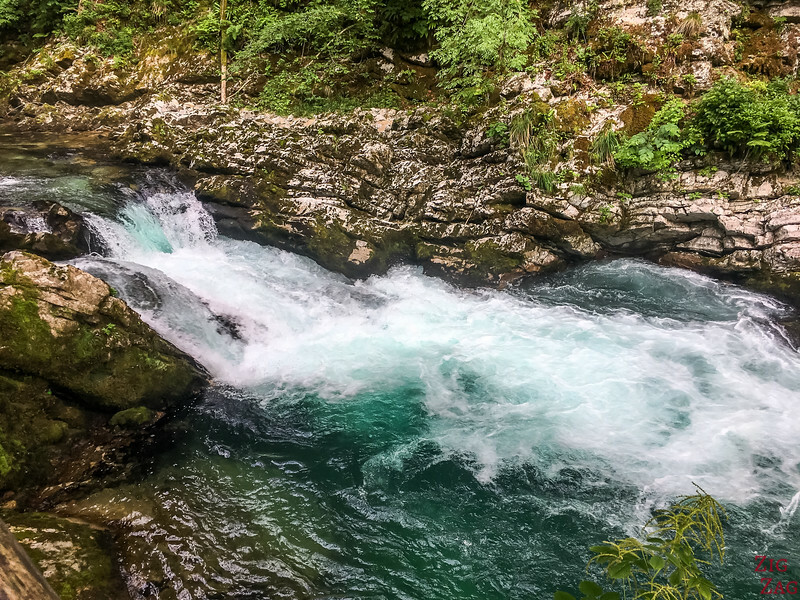 It was the Radovna river, blocked by ice from the Bohinj glacier, changed course and cut a new path through to soft layer of limestone between the Borst and Hom mountains. 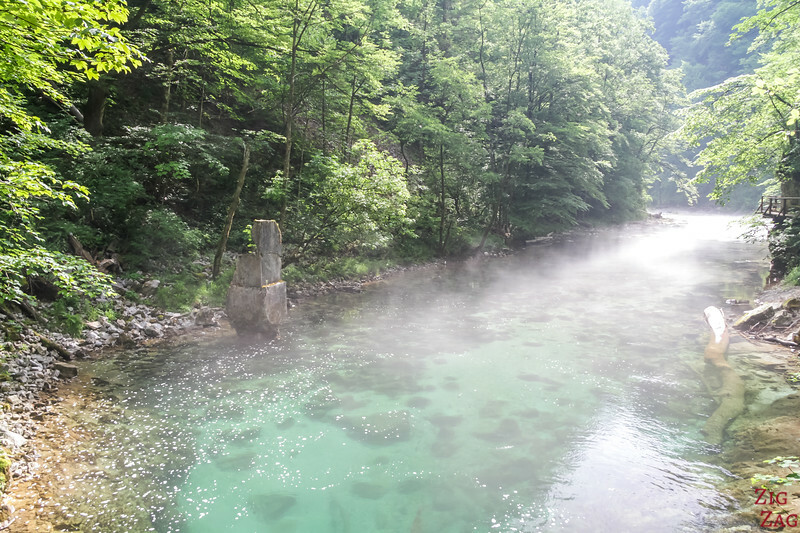 I visited in the morning and the combination of light, stillness, water roar and mist was just perfect! 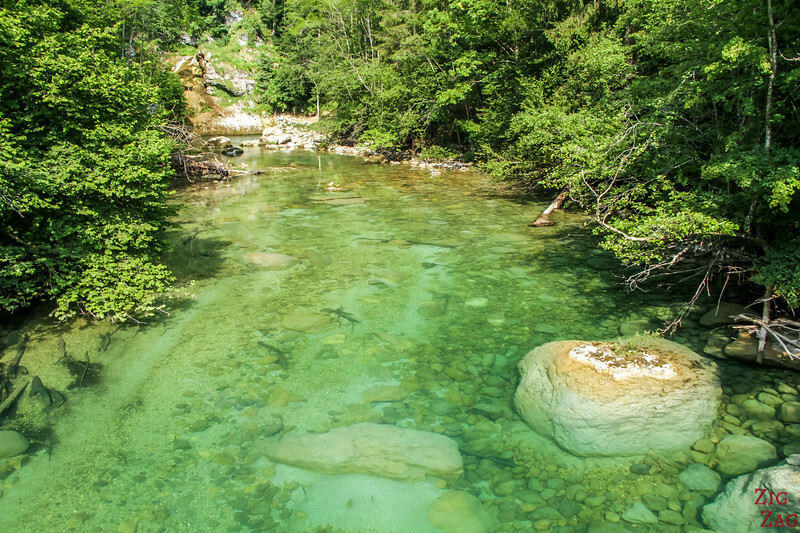 One of the particularity of the rivers and lake in Slovenia is that they display an emerald color. 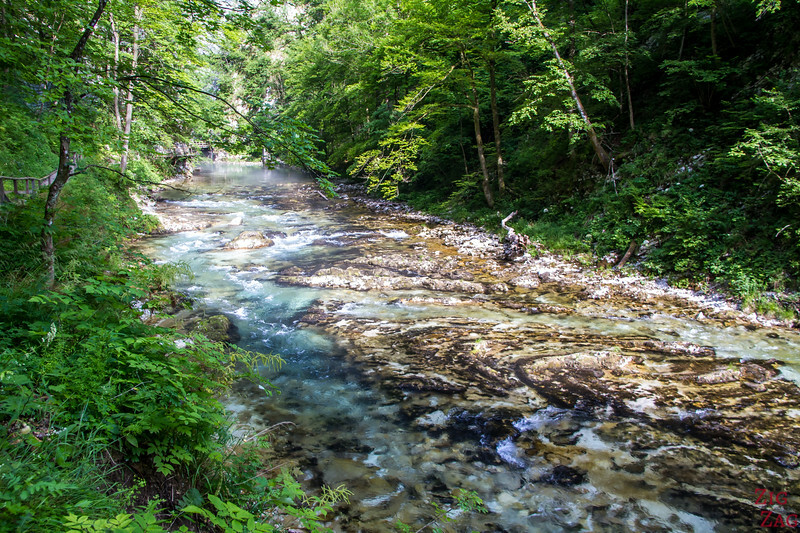 This is also the case in the Vintgar Gorge. 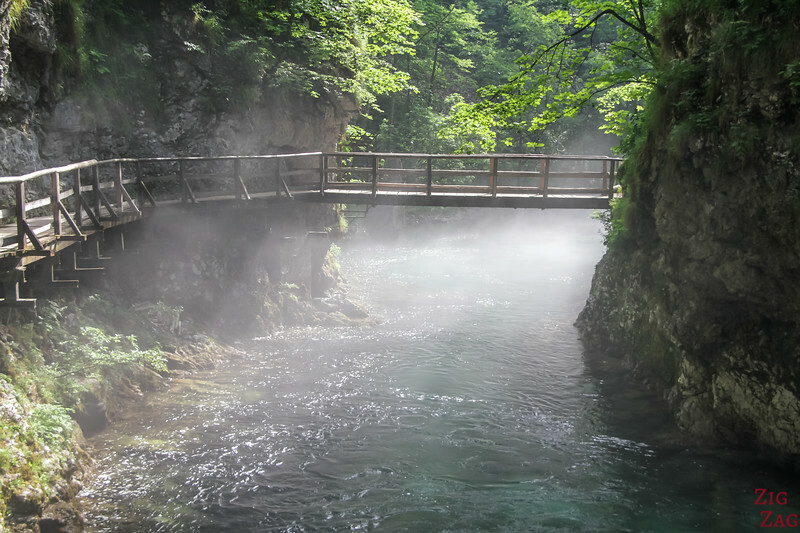 The second half of Vintgar brings another atmosphere. Some sections are wider and quieter. 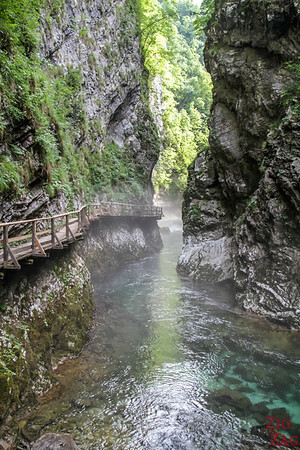 So you walk on a dirt trail rather than against the gorge wall. Here you can see a bit more of the vegetation. 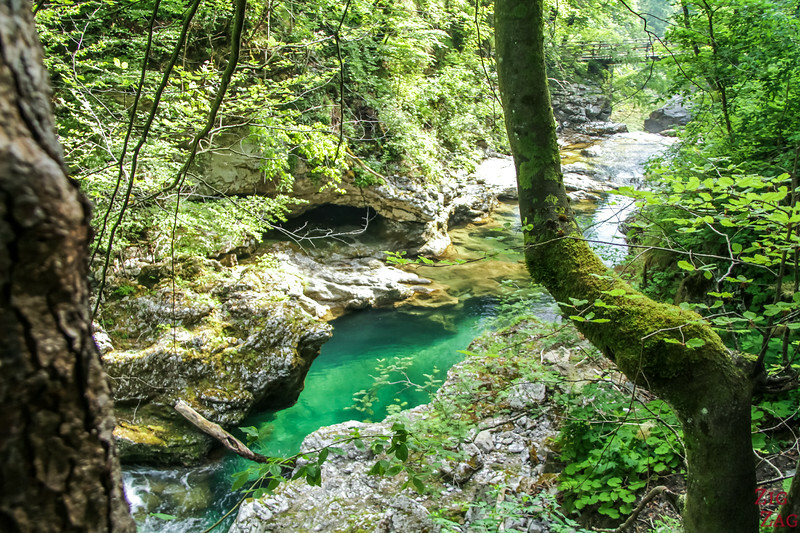 Because of it special conditions, you can find plants in the gorge that do not grow elsewhere in the region. I love watching the way the rocks are cut and colored. Sometimes it still gets narrow and the water start rushing again. But other times, it is quite still and you are wondering where the fairies are all gone! Towards the end you see 2 man-made structures on the river. Above the Gorge is the stone arch bridge. 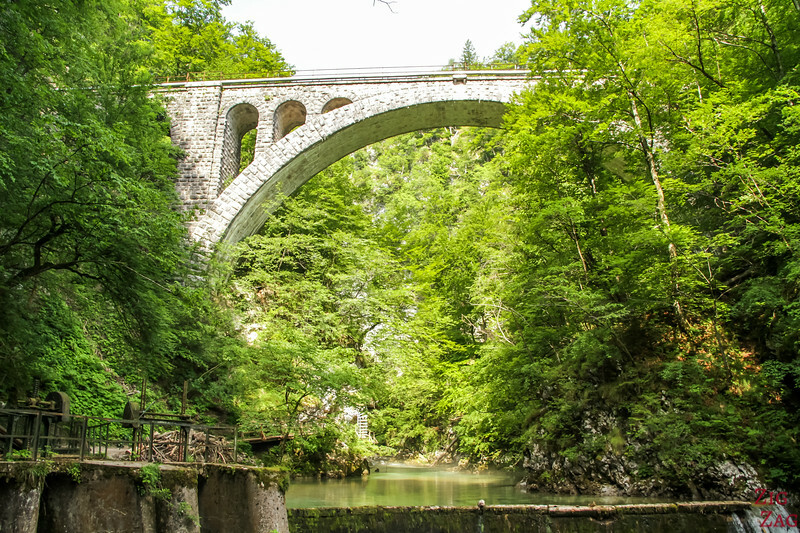 It is the bridge of the Bohinj railway and it was built in 1906, 33m above the river. 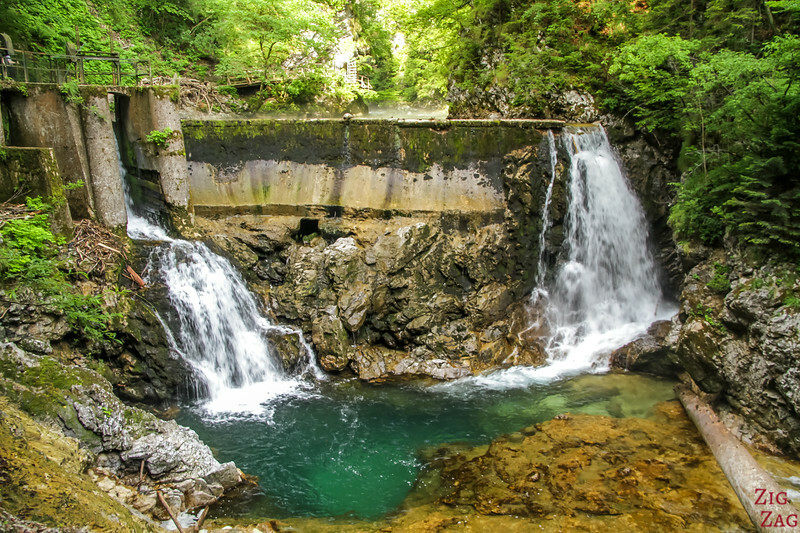 Just below is the dam where the water is routed to a small hydroelectric power plant. I must admit that I was a bit disappointed to discover that at the end of the gorge. It was so wild before! 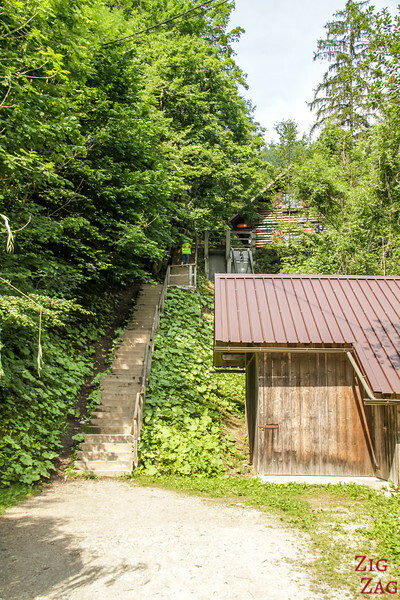 If you are not too tired, you can walk down the 60 steps past the hut (just keep your ticket with you to enter back). 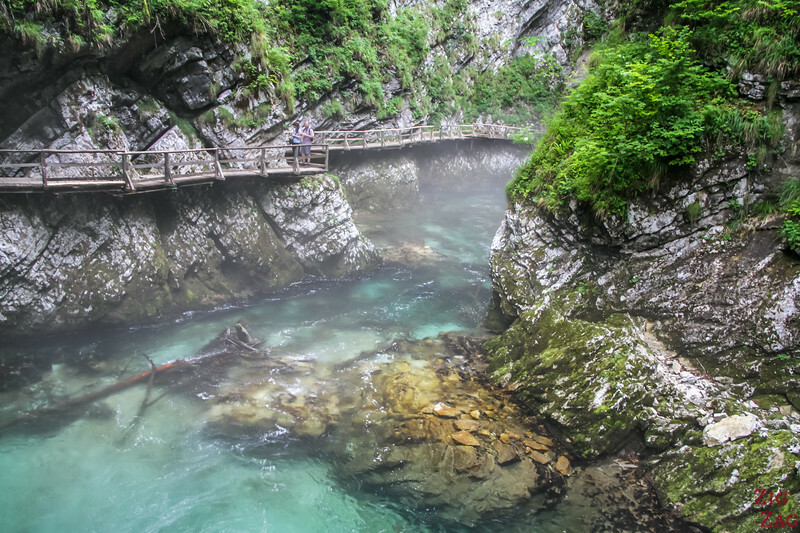 Once at the bottom you cross a bridge where once again you can admire the emerald color of the water. There are no other path. So you will have to turn back and go through the same trail to get back to the entrance. But who will complain? The scenery is as beautiful as ever. Below are a few more photos because I can't stop sharing! 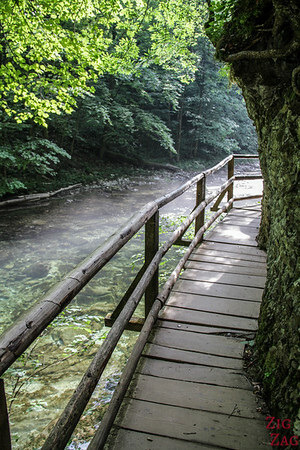 The Vintgar gorge is closed in Winter and the boardwalks not maintained until the start of the new season. Some people do get over the fence but this can be dangerous! If you have the time I really recommend to do both, because they are quite different and both beautiful. 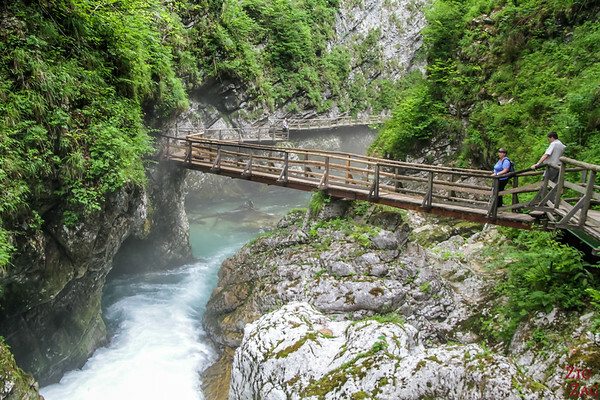 However if you are limited in time, my preferences goes to the Vintgar Gorge which I think is more interesting visually and easier to access. 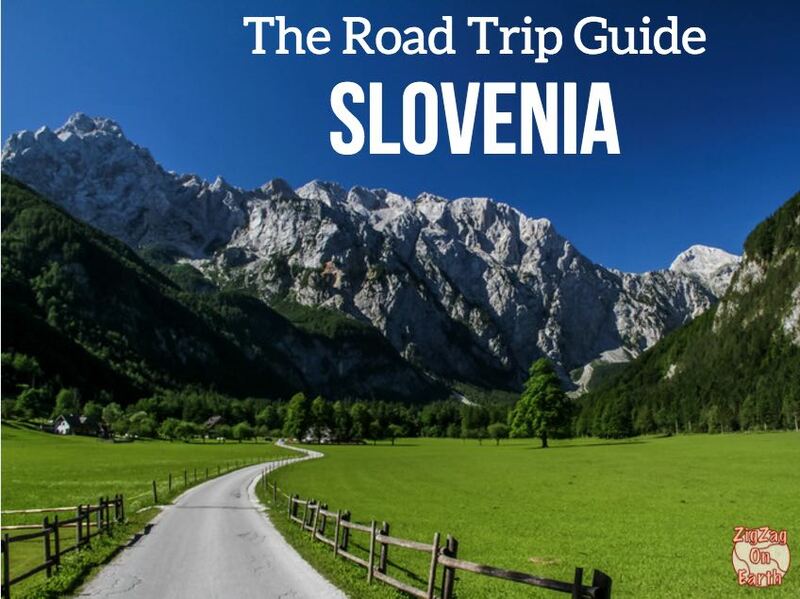 It is a 1h drive from Ljubljana to Lake Bled on motorway. 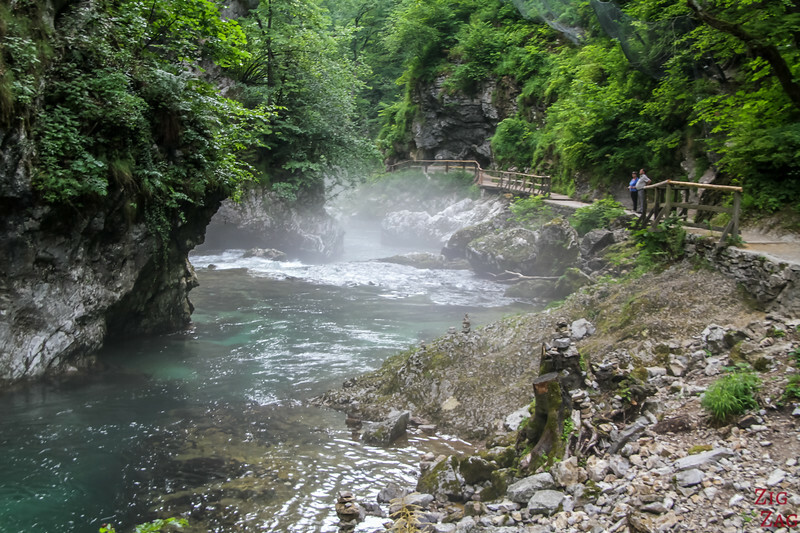 Best time to visit Vintgar Gorge - Early morning or late afternoon to avoid the crowds. When it starts getting busy, it is harder to stop, enjoy and photograph. Because then a long queue starts building after you. Frustrating! 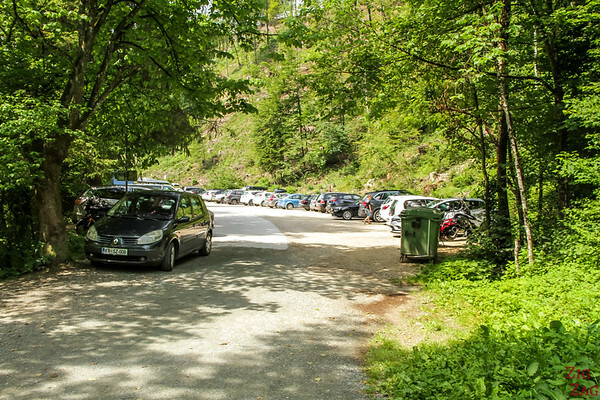 Parking is free which is rare in Slovenia! The hike is easy - just a few steps - we were unfit and had no difficulty. Don't wear a big backpack. To cross other people on the narrow section it gets difficult! 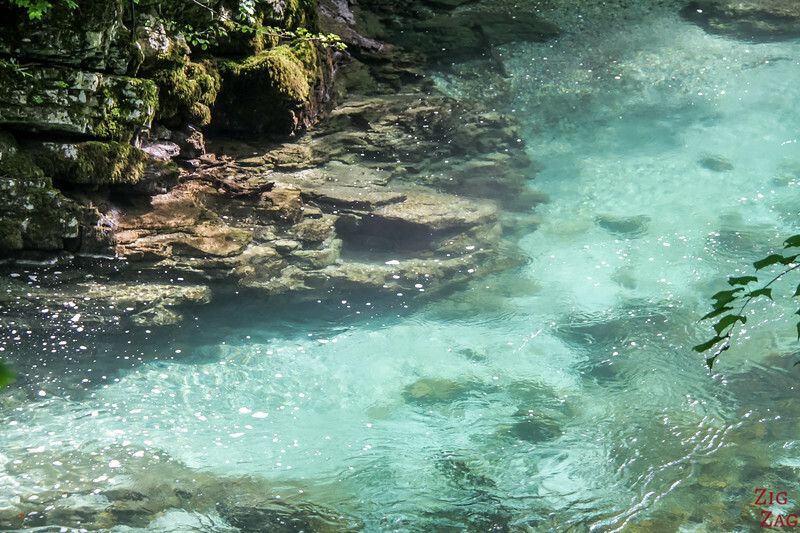 Discover more things to do & places to see in my Travel Slovenia Destination Guide. A must visit, don't you think? 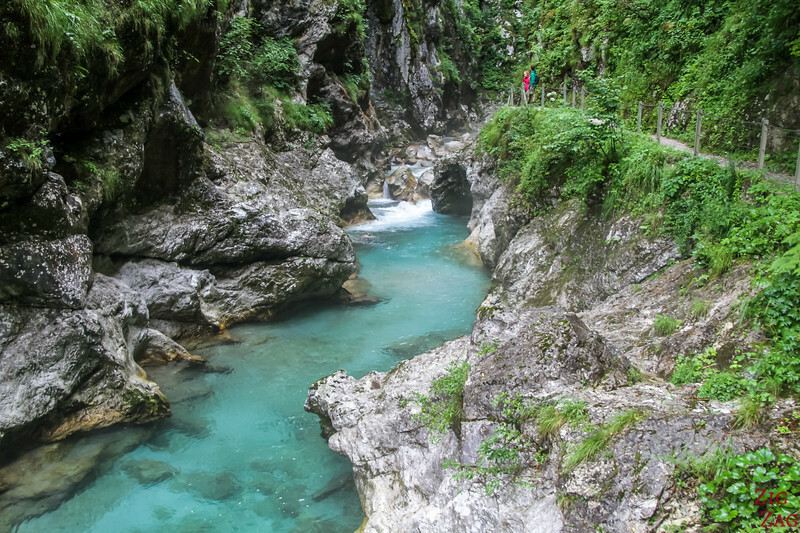 Slovenia Landscapes in 30 pictures – Beauty everywhere!